On Wednesday night the power at might house went out. Now I’ve been through more power outages than I are to remember, but this one seemed to be the worst I can remember. It was cold folks. Really cold. Add to it that early in the Fridge Fest, just when it go to really freaking dark, trees in the neighborhood started to come down. 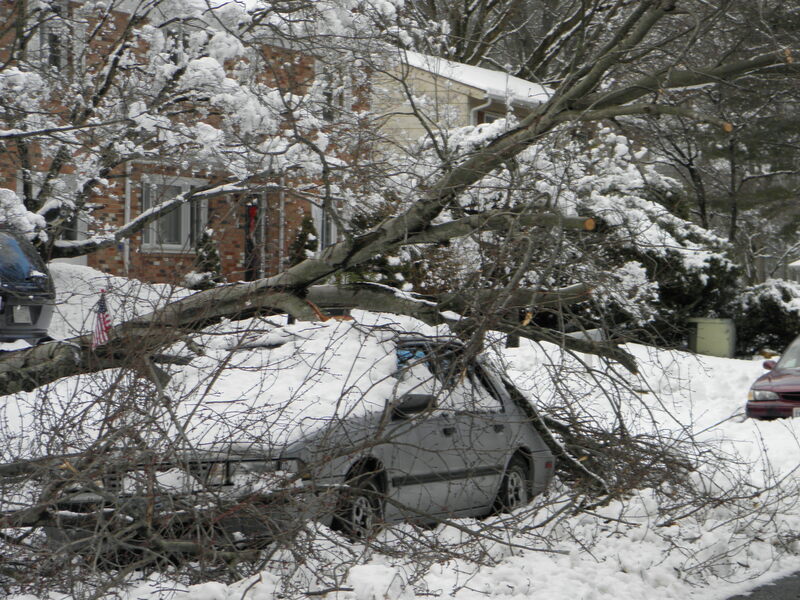 Here’s an aftermath picture of my next door neighbor’s car. My husband and I went out when it happened, just after 9 PM, to do what we could to help. Originally the very large tree branch laid across the road too! Another neighbor had a small chainsaw so we were able to cut up the tree enough to clear the street so that vehicles could get through. It was really eerie standing in the quite darkness of the neighborhood hearing the cracking sounds of wood splitting as trees and branches feel in the wooded area behind the row of houses, and in yards we couldn’t see in the darkness. It was just under 24 hours until the power returned. And it was a long 23.5 hours at that. We managed to get dug out, gawked at some of the houses in the neighborhood where trees were now in places that trees do just not belong, and found heat in a local mall. When we got home the house was cold. 51 degrees as a matter of fact. It could have been worse, and there are other neighborhoods not far from ours that are still without power – boy do I feel for them. It’s a really damp cold. Snow feel for a long time, and fell again this morning. It’s the kind of cold that get’s inside you and takes you a long time to warm up from. It makes you appreciate just how spoiled we are. Most of can walk into a room, flick the light switch, and have light. If we get cold we can turn the heat up. I will gladly admit that like to be spoiled. Very, very spoiled.